One of the things we pride ourselves in is the fact that we do not take public information for face value, nor do we even contemplate the sources very much. That seems risky right, but in realty what we are being sold and who’s selling it are about as trustworthy as a 3 year old holding an ice cream cone without giving it a lick. In fact, we are inundated with various reports from all over the World Wide Web, main stream media, etc. What we pride ourselves in is that we seem very well versed in taking a plethora of small bits of information and parsing out the narrative that is trying to be painted. Then we take that narrative and add a bit of Qui Bono. Our over 20 years of experience in quantitative and qualitative financial markets trading and analysis have honed our skills and we consider ourselves , guilty of providing acute angles in this obtuse world. Some of our readers may think some of our assumptions are outlandish, foolish and ill conceived. Its ok, we understand all too well the massive amount of conditioning that the general population has been mired in, so we don’t blame you. In fact, one of the things we hope you do is try to take the narratives we conclude and do a little personal digging yourself, uncover some of your own conclusions. We hope you find concrete evidence to back up your conclusions or at the very least, display some relative and cognitive thesis that backs it all up. OK, so with that out of the way let’s get to this week’s letter. 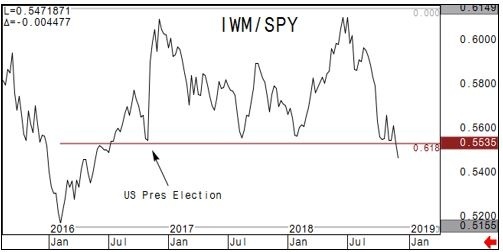 We have a lot of ground to cover and we are going to try and recap a crazy few weeks of POTUS jawboning and equity market false euphoria, topped off with a bit of yield curve and bond market volatility. 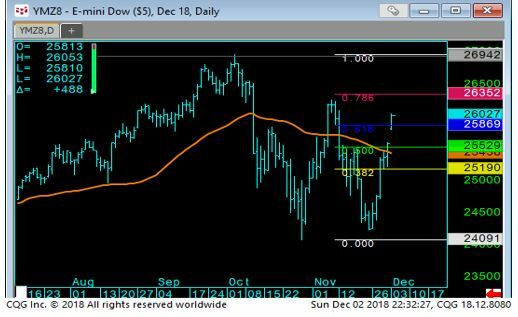 Our last letter from the 21st talked about the equity markets reaching some decent over sold levels, especially in the NASDAQ where we highlighted the very important level of 6495. This level did its job the first time down that is certain. Now call us cynical but was it the technicals that led to the bounce? Was it fundamentals? Was it the FED itself, feeling the POTUS pressure to calm the hawkish rhetoric? What we can say with certainty is that it was most likely a combination of all those things. On Wednesday Powell really gave the market a boost when speaking at the Econ club of NY, he said, “interest rates are just below broad estimates of a neutral level.” This drove equities to rise sharply posting their largest up move since March. Our long time readers know full well that our long term hashtag motto is #QE4EVR! They aren’t fooling us, we fully understand the modern monetary mechanics and we know that the Minsky moment is always just a downgrade, leveraged missed bond payment, BK away. Toss in the fact that every single corporate treasury has now swallowed the Modigliani and Miller capital structure propositions and have gone full tilt on their balance sheets sacrificing long term viability via debt for equity swaps. The Federal Reserve released their minutes last week and although December’s meeting is just a formality, as they are widely expected to hike another 25bp, the future isn’t so certain. We know the FED’s ultimate goal is three-fold, buy itself some time, buy itself some room to cut for future recession and to get the Fed Funds above the US 10yr rate. We feel the last point is a very important piece for squashing excessive equity and leveraged finance speculation. 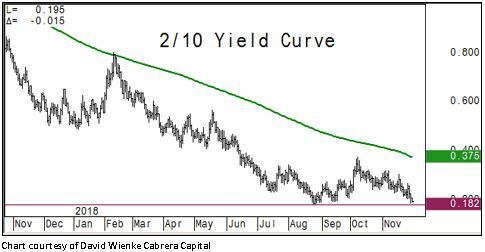 We like looking at this curve and it’s’ not the one most recession callers look to when speaking of inversion, but for us we feel the 10yr rate is the standard and this inversion will make it very difficult for corporate treasurers to roll over their existing debt loads at lower rates. Do we even need to mention how massive those debt loads are? We all know that they are hoping for asset inflation but considering the US economy is undoubtedly going to soften in the coming years, we aren’t sold on their hopes coming to fruition. The markets aren’t fooling us, this market is under pressure and the facts haven’t changed. The biggest being the Fed will continue to punish corps with higher rates. 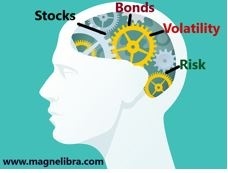 The other factor nobody seems to realize is that speculation is the largest driver of stock prices, don’t believe us? Go look at book value and dividend discount models and account for the difference…we would like you thoughts on any counter arguments. Anyway in a bear market, nobody is safe and as we have spoken at length, you will get large up moves at times…this was just one of them. Ok that’s it, our condolences to entire Bush family as we lost the 41st president last week, George HW Bush. They are closing both the bond and equity markets on Dec. 5th for a day of mourning. In our 20 years we can’t remember the powers in control closing markets for something like this. It sparks our interest that is for sure. We are also watching the Mueller , Comey, Lynch ongoing saga and testimonies this week. 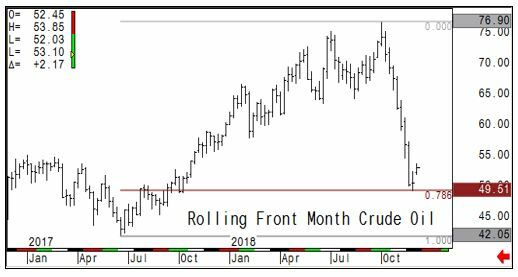 There is a lot going on behind the curtains and we urge you to do your research on this as we deem it a very big contributor to volatility as well. We have given you enough information for now and we will continue to keep an eye on this equity weakness and absolute curious bond strength as of late.